The highly anticipated Los Olivos Marketplace in Irvine opened a few months ago near Irvine Spectrum, bringing with it some beloved businesses and a gem that grew its loyal followers from a first location in Dana Point - Angelina's Pizzeria Napoletana. We were invited in to try out their brunch menu but fell in love with the way that Executive Chef Sandro Nardone approaches the entire menu, not just his pizza. While there were some dishes that certainly portray his creative freedom as a chef, for the most part, the array of food at Angelina's is true to southern Italian cuisine and reminded me of the summer I spent in the country itself. The focus on ingredients' true beauty and inherent goodness made for simple dishes that stood proudly delicious in their own right. Before you approach the menu, however, you are met with a sophisticated interior design that makes one wonder if they really stepped into a pizzeria or a fine dining restaurant. Earthy oranges and seafoam turquoise accents gave color to the mixed media furnishings and walls. 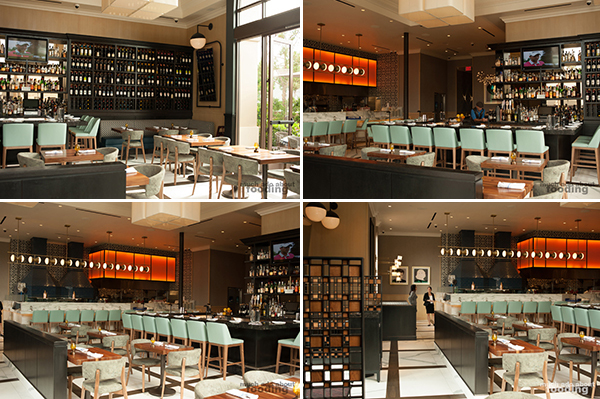 Artistic light fixtures and expansive windowed walls contributed the brilliance of natural light (with a little help) and washed the restaurant with an open air feeling. If you explore further towards the back, you'll spot the 900°F almond-wood-burning ovens outfitted with glazed deep blue and gray tiles. Frankly, the restaurant is beautiful, and we hadn't even seen the menu at this point yet. "The biggest thing in the United States is the use of butter; we use very little of that. All my dishes are based on original flavors so we use extra virgin olive oil. It gives ease to digesting and allows ingredients to show. I try to get chefs to cook with olive oil because to me, that's number one in the world. I could just live on olive oil and bread. Going back to being simple is the best." We spoke with Chef Nardone openly about how he composes his menu and praised the refreshing lack of novel-length dish descriptions. His own experience as a chef has been built upon the philosophy of simplicity and sincerity, trusting in the techniques of old and adherent to the beauty of traditional; as he puts it, "old people are never wrong." Some restaurants do try to load up on flavors and ingredients on one plate, masking what the focus point of the dish actually is, but at Angelina's, this is not the case. "What I'm trying to do is something easy with high-end ingredients where you can taste what your eating. That's my philosophy." 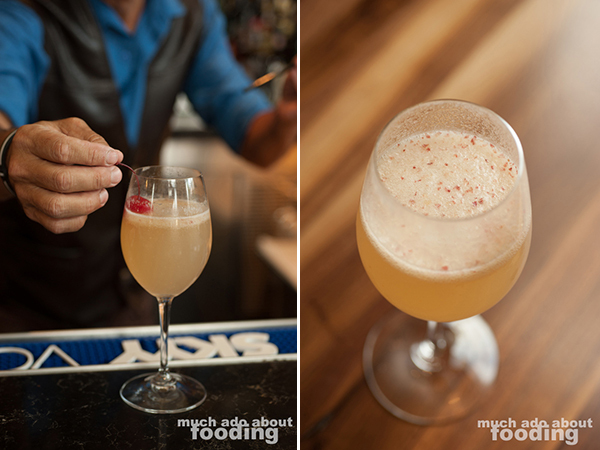 We cheers-ed to that sentiment with a Bellini ($6) off the brunch menu, seasonally apt with a white peach base. If I could have found the stomach real estate, I would have had every one of the salads on Angelina's menu because each of their descriptions tempted me for various reasons. Most importantly, they were apparent in their balance of flavor profiles and highlighting of rich produce. 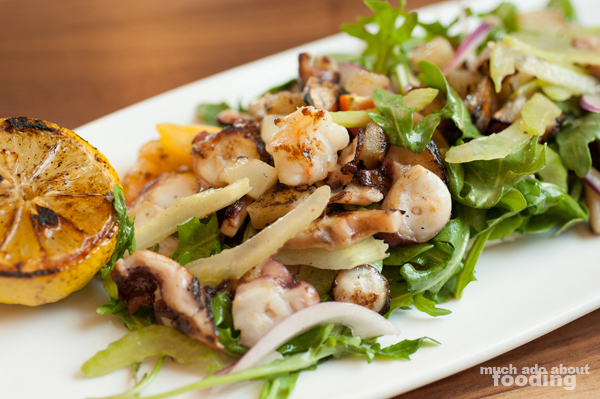 We landed on the Angelina Salad ($10 - wild arugula, fennel, orange, pine nuts, Gaeta olives with pits, and Sicilian white raisins) and Insalta di Polipo e Gamberi ($18 - grilled octopus and Mediterranean shrimp with wild arugula, roasted potatoes, red onions, and heirloom tomatoes drizzled with extra virgin olive oil and fresh lemons). 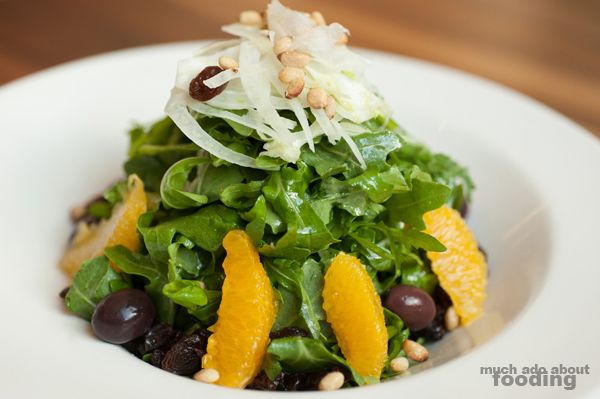 The namesake salad was composed mostly of the wild arugula whose peppery nature played well with thinly shaven fennel and juicy orange slices. The olives were slightly distracting as they had not been pitted but because of their bold flavor, this practice of spitting out the pits once you got to one gave the moment a necessary stopping point to let the brine wash over your mouth. It certainly was a simpler salad than the second one which ultimately was my favorite for the meal as both the octopus and shrimp were grilled to perfection. They were complemented very well by 1/4" cubes of roasted potatoes which added a lovely texture to each forkful, and of course, heirloom tomatoes made for bright bites. 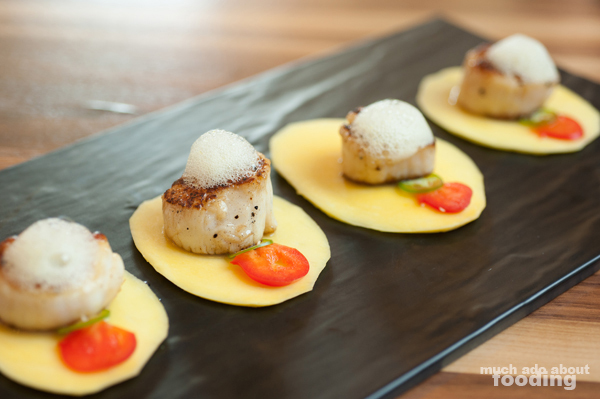 We also augmented the start with their Capesante su Carpiccio di Mango Aria di Lime e Pepperoncino ($32 - pan-seared scallops on mango carpaccio, vanilla extra virgin olive oil, and pepperoncino) which had a very intriguing description at first glance. Chef Nardone did create this one entirely as it is not a traditional Italian dish, and its conception was meant to represent summer. The sweet crispness of thinly sliced mango was tart and playful, uniquely brought to the forefront of your palate once the spicy pepperoncini hit your tongue. The heat of the pepperoncini spun out a pleasant buzz in the mouth without being painful, and the inclusion of "air of lime" as foam presented the slight bitter zestiness of the citrus. 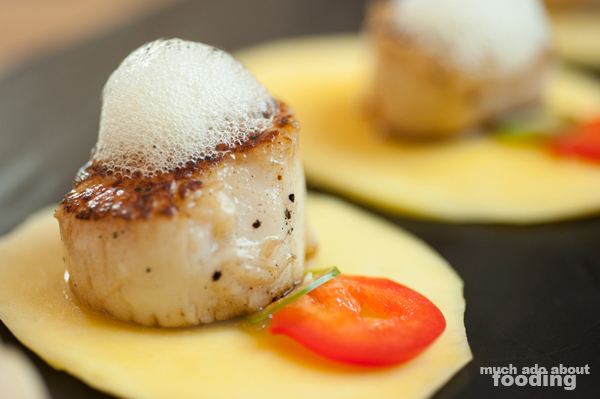 All of those pieces were married together by the large, perfectly seared scallops that were seductively soft and rich in natural flavor. What a delight of a dish. A chef first and foremost, Chef Nardone intended to make a high-quality pizzeria when he first started that had respect for ingredients and tradition. Having had family in Orange County whom he visited frequently, he found the area severely lacking in good pizza so wanted to meet that need with perfection but not the presumptuous feeling of a three-star Michelin restaurant. "This is the way pizza should be done. I didn't invent it but it's straightforward. This is pizza from the 1500s/1600s. I have tried to change the dough fermentation to get it to be lighter and easier to digest for people BUT I didn't invent anything." As you might have experienced, there are multiple styles to pizza. Angelina's features Neapolitan pizzas which means that it needs to be made in a certain manner with certain ingredients (fine wheat flour, San Marzano tomatoes, etc) and cooked in a particular way (60-90 seconds through a high-heat wood-burning oven, typically ~900-905°F). This results in a thin pizza pie with an elastic, bubbly crust topped with a few ingredients. We love the style and what is produced by blasting such a creation in high temperatures. The first option we tried was because of the brunch menu - their Breakfast Pizza ($14 - Mozzarella di Bufala, egg, and choice of sausage, guanciale, or spinach) on which we chose guanciale. This personal-sized pizza comes with a house side salad which was very tasty on its own as a combination of mixed greens and light vinaigrette. 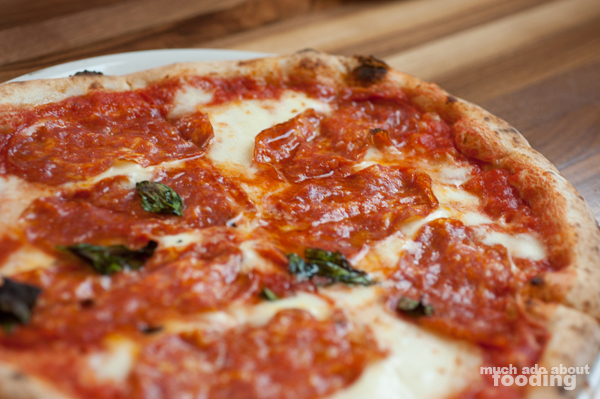 Aside from the expertly formed dough, the pizza found great favor with us because of its use of such rich cheese. 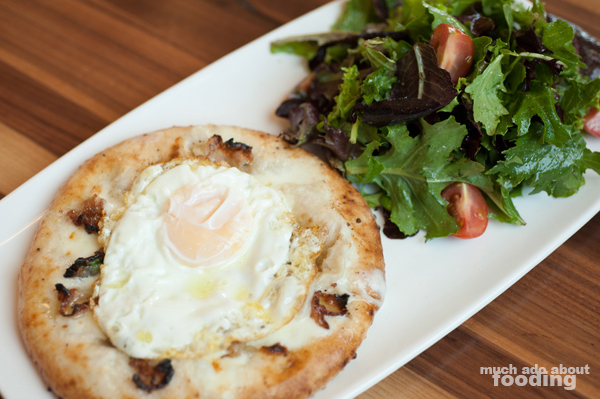 You can taste the difference in a Mozzarella made from buffalo milk - it is creamier by far and much more luscious; melted in a quick-fired pizza, its silkiness felt just right with the savory runny egg and salty, crunchy guanciale. The Diavola Pizza ($16 - choice of mild or spicy salame Napoletena-style, Mozzarella di Bufala, San Marzano DOP pomodoro sauce, and fresh basil with pepperoncini oil on spicy salame choice) with spicy salame came out much larger than the breakfast version, featuring the glory of heat associated with diavolo sauce. Again, the type of Mozzarella used on the pizza made a world of difference in how every piece came together but their umami-laden pomodoro was what stood out to me. Savory-sweet, tangy, and rich, the San Marzano base is a treasure. Now when we thought we were done, we realized that we were wrong because Angelina's also takes pride in its desserts. 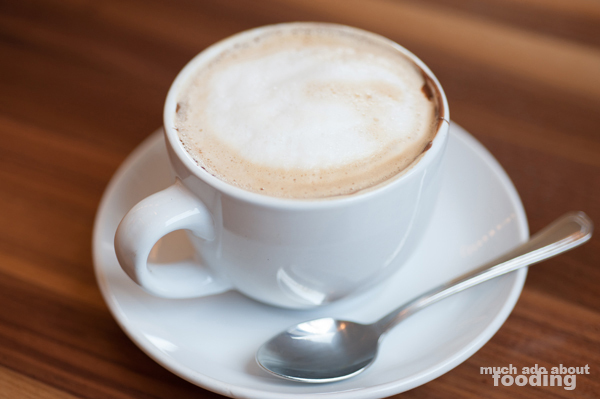 An interesting one to end with if you don't want to dive into that deep end of the menu is to cap off your meal with their Cocoacchino ($6). As coffee tends to round out Italian meals, this one plays on the custom and adds in the element of Nutella, the hazelnut chocolate spread that Europeans know and love. The mug is coated in the decadent spread before espresso is added. Put this one in your books as a must-try. Other treats that morning included a Nutella Pizza and Tiramisu. 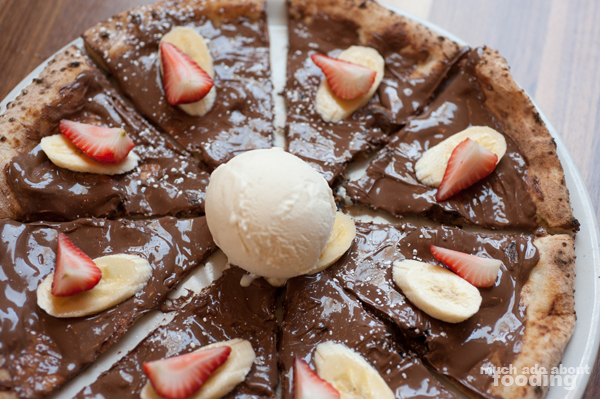 Whereas the menu does have a Nutella calzone as part of the breakfast section of brunch, this pizza version of Nutella loving allows for sharing (you really have to) and seeing the entire spread laid out. Slices of strawberry and banana make it less cloying, and the generous scoop of vanilla ice cream unsticks the slices from the back of your throat from all the chocolate. Surprisingly, it wasn't too sweet of a dessert and therefore a good option for a large party. It was enjoyable but the tiramisu was on a definitively different level. 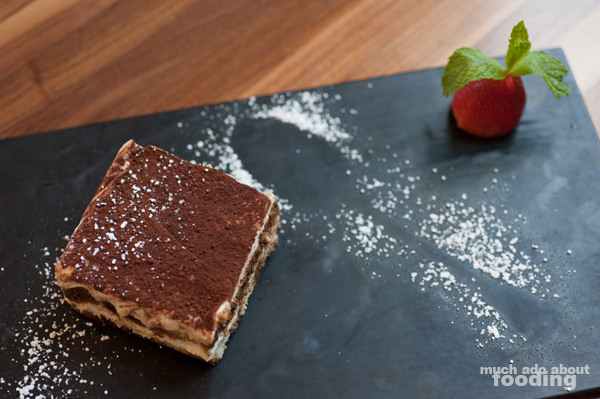 "Real tiramisu doesn't have liqueur so I make it without. I made it the same way as we make it there and don't add sugar to the espresso. We use the sugar already on the ladyfingers. In the beginning, people told me that everyone wants the sweet stuff but I said no. You have to educate people." Every component of the tiramisu was balanced. Many restaurants fail to keep the iconic dessert from becoming soggy but Angelina's has made their tiramisu into a piece of art. The right ratio of espresso to ladyfinger to mascarpone to cocoa powder to even powdered sugar graced the black slate that arrived. You, dear reader, need this in your life. As a whole, we cannot stress enough how much we did enjoy our time at Angelina's; I felt my face light up as we spoke to Chef Nardone and tasted his food because it made me think fondly back to my time in southern Italy and reminded me of why I love the Italian cuisine and culture. If you need to find this sincere establishment, they are located in the Los Olivos Marketplace at 8573 Irvine Center Drive, Irvine, CA 92618. We also hear that they are up for "Best Italian" in Orange County for the upcoming Golden Foodie Awards so if you enjoy them, a vote should probably be thrown their way for that honor. I'm excited to return to see more of their menu. We had gone in for their brunch hours (Saturday & Sunday from 10AM-3PM) but they do do full lunch and dinner throughout the week. If you're interested in the brunch though, there is an a la carte menu but their Social Brunch seems quite the steal as well - for $30 per person at a two guest minimum, you can do a family-style meal with choice of one pizza for the whole table, two entree plates, and a shared carafe of bellini or mimosa. If that's not a great way to start your weekend, I'm not sure what is.